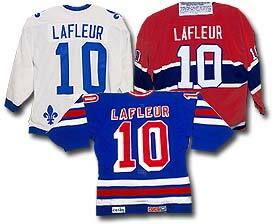 his NHL teams: the Quebec Nordiques (top left), Montreal Canadiens (top right), and New York Rangers (bottom). 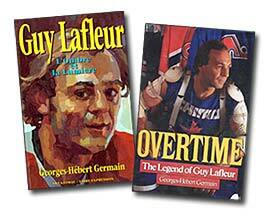 The French and English editions of Guy Lafleur's biography written by Georges-Hebert Germain. 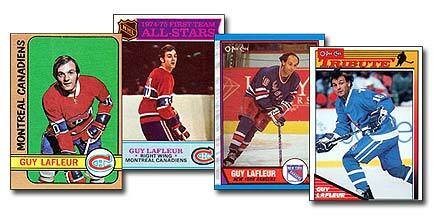 Farewell Tribute card from the O-Pee-Chee 1991-92 series. 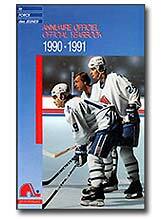 The 1990-91 Quebec Nordiques media guide, Guy's final NHL season. Guy is pictured without a helmet. 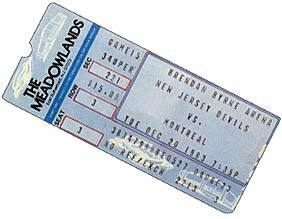 December 20, 1983 at the Brendan Byrne Arena versus the New Jersey Devils.